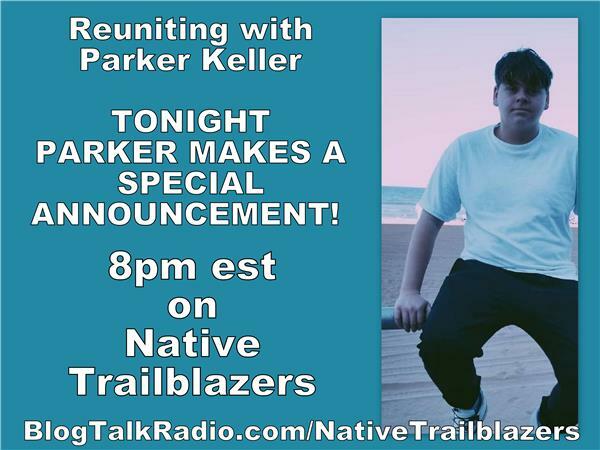 Reuniting with Parker Keller - PARKER MAKES A SPECIAL ANNOUNCEMENT! If you liked this show, you should follow Native Trailblazers. He has been in another state for 8 years, but now he is back with the family. Tonight our amazing 16-year-old nephew makes an amazing announcement on Native Trailblazers. You DON'T WANT TO MISS IT! WE LOVE YOU BUDDY! Follow him on Instagram. https://www.instagram.com/parker_keller100. Shé:kon and Thanks for joining Native Trailblazers! The Native Show with over a million listeners worldwide! For over eight years, our award-winning Native themed online radio show has been delivering the hottest topics in Indian Country to your desktop, mobile or other listening devices! Listen in every Friday night at 8pm or any time after in archives!